Kevin Ford is one of the few sheep shearers -- in the world -- who still use blades to shear sheep. 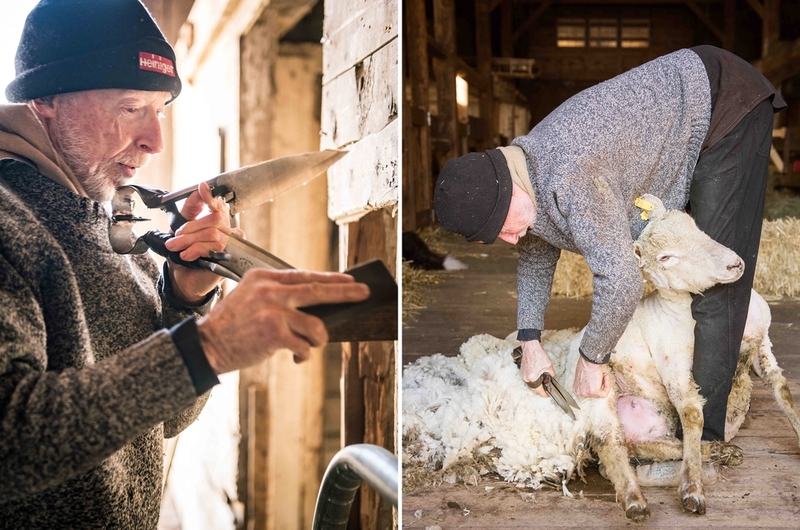 A native New Englander, his work takes him up and down the entire east coast, shearing sheep as well as teaching others. Mr. Ford comes to Clark Farm in the late winter to shear the ewes for lambing season. This year, a cold March morning welcomed him and a group of local fifth-graders. An obvious question was, "Don't the sheep get cold without their wool?" According to Mr. Ford and the farm educator, sheep are naturally adept at regulating their body temperature. Because they are ruminants (they have four stomachs), the act of digesting creates a fair amount of heat. Every ewe at Clark Farm was shorn -- even the one who had just given birth to twins right after Mr. Ford's arrival! She needed a little coaxing to come to Mr. Ford, but he had her relaxed and calm in no time.